Thoughts: This is a helmet I always wanted to find, never did, and decided to make it myself. It looks nice in my opinion. The real helmet showed up in Oakland with the move of the Athletics from Kansas City. apostrophe "s" on it and here is the proof! Good luck finding this one. Thoughts: Another of my "What If?" helmets. It would have been weird to see them in a helmet like this, but they did wear a cap like this as is evident by the photo, but come to find out it was just a cap worn by the managers. Thoughts: I recently found an all Kelly Green helmet, but it has a different style "A" that you can see farther down on this page. I think I put the "apostrophe" and the "s" to close to the "A" on this helmet. Thoughts: This is just a very strange duck billed helmet. It is in pretty rough shape as someone actually took an X-acto knife to the logo for some odd reason. Dates used: 1972 - 74? Thoughts: I finally found an all Kelly Green helmet! Thoughts: I think the dates are right on this helmet, but I'm not for sure. This helmet is not an easy find. Still looking for a photo of this helmet or cap in action. Thoughts: This helmet could be seen as the early days of Reggie Jackson. I can't find any photos with this helmet or cap for that matter. Thoughts: This helmet is the same as the one above, but just a little bit different in color. I can't find any photos with this helmet or cap for that matter. Thoughts: This is the good old Kelly Green helmet. This has always been one of my favorite helmets. Thoughts: This is just a duck billed helmet repro of the one above. Dates used: 1980 - 83? Thoughts: Notice the difference between this helmet and the one below. This helmet is missing the little tail to the left of the "A's" logo. Thoughts: This is what the A's still use today. I guess the highlight of this helmet would have to be the bash brothers of McGuire and Canseco. Thoughts: This fatter "A" apparently is just a different style of "A" used by the souvenir companies. It also appears that the A's at sometime have chopped off the little swirl to the lower right of the "A" logo on their helmets, but not on their caps! How bizarre. Thoughts: Another Retro Helmet put out in 2003. The logo is huge, the green is terrible, and I'm not impressed. It's kelly green, not pale seaweed green boys! Plus, there is that stupid TM logo again. At least it's tiny on this helmet. Dates used: 1993 - Present? Thoughts: The newer style helmet. A helmet that Eric Chavez leads his team with. Thoughts: I'm not for sure if this helmet has ever been used, even as an alternate, but they did wear a hat like this. I'm guessing that it was a promotional helmet. 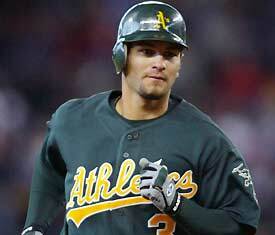 Thoughts: This is some type of promotional helmet that the A's have never worn. It is more of a grey color than the silver color that it appears to be here.